Wondering if you can let your kids walk to the park or wait in the car for a few minutes—legally? At Free-Range Kids, we believe parents are the best judges of what their kids are ready for, when. But the sad fact is, some loving and responsible parents have found themselves in legal trouble when a busybody or law enforcement official perceived their actions as unacceptable. Until the day we see the Free-Range Kids and Parents Bill of Rights become the law of the land—a bill stating kids have the right to spend some time unsupervised, and parents have the right to let them—here’s a guide to state child welfare laws. You’ll see that 19 states have specific laws about when it is legal to leave a child in a car. Five states have laws that specify what age a child can be home alone, and 10 states have “guidelines.” For states that don’t have these, the child neglect laws are the next most relevant sources of information. You can find those here. This list is not a legal document and some localities have rules and guidelines even when the state does not. But we hope this at least provides a starting point. And, as you’ll see, there are two lists. Please consult both! Home Alone Age: 6 (Guideline) From the DCF of Kansas: “Young children from 0-6 years should not be left alone for even short periods of time. Children 6-9 years should be left for only short periods, depending on their level of maturity. . . . Children 10 and above probably can be left for somewhat longer periods, again dependent upon the other factors. Home Alone Age: 10 (Guideline) From the Tennessee State Court’s website: “There is no legal age for children to stay at home alone. Parents are advised to use their best judgment, keeping the child’s maturity level and safety issues in mind. Younger children have a greater need for supervision and care than older. Obviously, young children under age 10 should not be left without supervision at any time. In most cases, older teenage children may be left alone for short periods of time. No law for leaving child in car. Car law: No child that is six years of age or younger may be left in a car unless they are with a person who is 12 years of age or older, under circumstances “where there are conditions that present a significant risk to the child’s health or safety,” or when the engine is running and/or the keys are in the ignition. The full law is below. Unattended Child in Motor Vehicle Act “Kaitlyn’s Law” California Vehicle Code Sections 15620, 15630, 1563215620. (a) A parent, legal guardian, or other person responsible for a child who is 6 years of age or younger may not leave that child inside a motor vehicle without being subject to the supervision of a person who is 12 years of age or older, under either of the following circumstances: (1) Where there are conditions that present a significant risk to the child’s health or safety. (2) When the vehicle’s engine is running or the vehicle’s keys are in the ignition, or both. (d) (1) Subdivision (b) and Section 40000.1 do not apply if an unattended child is injured or medical services are rendered on that child because of a violation described in subdivision (a). (2) Nothing in this subdivision precludes prosecution under any other provision of law. 15630. Notwithstanding any other provision of law, the fines collected for a violation of this division shall be allocated by the county treasurer, as follows: (a) (1) Seventy percent to the county or city health department where the violation occurred, to b e used for the development and implementation of community education programs on the dangers of leaving young children unattended in motor vehicles. (2) A county or city health department may develop and implement the community education program described in paragraph (1) or may contract for the development and implementation of that program. (3) As the proceeds from fines collected under this division become available, each county or city health department shall prepare and annually update a listing of community education programs that2 provide information on the dangers of leaving young children unattended in motor vehicles and ways to avoid that danger. The county or city health department shall forward the listing to the courts and shall make the listing available to the public, and may distribute it to other agencies or organizations. (b) Fifteen percent to the county or city for the administration of the program, from which will be paid the cost of the county to account for and disburse fine revenues. (c) Fifteen percent to the city, to be deposited in its general fund except that, if the violation occurred in an unincorporated area, this amount shall be deposited in the county’s general fund. 15632. (a) The department shall include information concerning the dangers of leaving children unattended in motor vehicles, including, but not limited to, the effect of solar heat on the temperature of vehicle interiors and the penalties for noncompliance with Chapter 2 (commencing with Section 15620), in the following materials distributed by the department: (1) The California Driver’s Handbook published under subdivision (b) of Section 1656. (2) The driver’s license examination administered under Section 12804.9, by including, on a rotating basis, at least one question in one version of the driver’s license examination that is periodically administered to applicants. (3) Any driver’s education materials certified by the department. (4) Courses and examinations for traffic violator schools. (5) Materials provided to secondary and post‐secondary schools and educational institutions. (6) Any materials provided to community education campaigns undertaken by the department and other state agencies, including, but not limited to, the Department of the California Highway Patrol and the Department of Transportation. (b) The department shall not republish materials before existing supplies are exhausted, but shall arrange for compliance with this section in the next edition or publication of those materials in the normal course of business. Car law: No child under the age of twelve years old may be left in a car for any amount of time that “presents a substantial risk to the child’s health of safety.” If this happens during the hours of 6:00 a.m. to 8:00 p.m. then the person that is responsible for the child is guilty of a class A misdemeanor. If this happens during the hours of 8:00 p.m. to 6:00 a.m. then the person that is responsible for the child is guilty of a class C felony. The full law is below. Sec. 53‐21a. Leaving child unsupervised in place of public accommodation or motor vehicle. (a) Any parent, guardian or person having custody or control, or providing supervision, of any child under the age of twelve years who knowingly leaves such child unsupervised in a place of public accommodation or a motor vehicle for a period of time that presents a substantial risk to the child’s health or safety, shall be guilty of a class A misdemeanor. (b) Any parent, guardian or person having custody or control, or providing supervision, of any child under the age of twelve years who knowingly leaves such child unsupervised in a place of public accommodation, which holds a permit issued under chapter 545 for the sale of alcoholic liquor for consumption on the premises, for a period of time that presents a substantial risk to the child’s health or safety, shall be guilty of a class D felony. (c) Any parent, guardian or person having custody or control, or providing supervision, of any child under the age of twelve years who knowingly leaves such child unsupervised in a place of public accommodation or a motor vehicle between the hours of eight o’clock p.m. and six o’clock a.m. for a period of time that presents a substantial risk to the child’s health or safety, shall be guilty of a class C felony. Home alone age: 12 (guideline). Car law: A child younger than six years of age may not be left alone in a car for longer than fifteen minutes or for any amount of time if the car’s engine is running. The full law is below. 316.6135 Leaving children unattended or unsupervised in motor vehicles; penalty; authority of law enforcement officer. (1) A parent, legal guardian, or other person responsible for a child younger than 6 years of age may not leave such child unattended or unsupervised in a motor vehicle: (a) For a period in excess of 15 minutes; (b) For any period of time if the motor of the vehicle is running or the health of the child is in danger. (2) Any person who violates the provisions of paragraph (1)(a) commits a misdemeanor of the second degree punishable as provided in s. 775.082 or s. 775.083. (3) Any person who violates the provisions of paragraph (1)(b) is guilty of a noncriminal traffic infraction, punishable by a fine not less than $50 and not more than $500. (4) Any person who violates subsection (1) and in so doing causes great bodily harm, permanent disability, or permanent disfigurement to a child commits a felony of the third degree, punishable as provided in s. 775.082, s. 775.083, or s. 775.084. (5) Any law enforcement officer who observes a child left unattended or unsupervised in a motor vehicle in violation of subsection (1) may use whatever means are reasonably necessary to protect the minor child and to remove the child from the vehicle. (6) If the child is removed from the immediate area, notification should be placed on the vehicle. Home alone age: 8 (guideline). Car law: Any child under the age of nine may not be left in a motor vehicle for five minutes or longer unless he or she is under the supervision of a person twelve years of age or older. The full law is below. [§291C‐121.5] Leaving a child unattended in a motor vehicle. (a) Notwithstanding chapter 571 or any other law to the contrary, a person violates this section if the person, being the operator or an adult passenger of a motor vehicle, leaves the motor vehicle for five minutes or longer when an unattended child is inside the vehicle, regardless of whether the operator or adult passenger is charged with the care or custody of the child. (b) Any law enforcement officer, firefighter, or rescue team personnel who observes a child left unattended in a motor vehicle and determines that the unattended child is in physical danger, or poses a danger to others, may use whatever means are reasonably necessary to protect the child or others and remove the child from the motor vehicle. If the person who left the motor vehicle with an unattended child inside cannot be located within a reasonable time, the law enforcement officer, firefighter, or rescue team personnel, upon removing the child from the motor vehicle, shall immediately report the matter to a police officer, as defined under section [587A‐4], who may assume protective custody of the child without a court order and without the consent of the child’s family. (c) Law enforcement officers, firefighters, and rescue team personnel shall not be liable in any civil action to any party for any act performed in good faith under this section. Home alone age: A minor must be at least fourteen years old to stay home alone. Full law here. Car law: No child that is six years of age or younger may be left in a car for longer than ten minutes, unless he or she is under the supervision of a person fourteen years of age or older. The full law is below. (720 ILCS 5/12‐21.6) Sec. 12‐21.6. Endangering the life or health of a child. (a) It is unlawful for any person to willfully cause or permit the life or health of a child under the age of 18 to be endangered or to willfully cause or permit a child to be placed in circumstances that endanger the child’s life or health, except that it is not unlawful for a person to relinquish a child in accordance with the Abandoned Newborn Infant Protection Act. (b) There is a rebuttable presumption that a person committed the offense if he or she left a child 6 years of age or younger unattended in a motor vehicle for more than 10 minutes. (c) “Unattended” means either: (i) not accompanied by a person 14 years of age or older; or (ii) if accompanied by a person 14 years of age or older, out of sight of that person. (d) A violation of this Section is a Class A misdemeanor. A second or subsequent violation of this Section is a Class 3 felony. A violation of this Section that is a proximate cause of the death of the child is a Class 3 felony for which a person, if sentenced to a term of imprisonment, shall be sentenced to a term of not less than 2 years and not more than 10 years. Home alone age: six (guideline). No law for leaving child in car. Kentucky does cite in their second degree manslaughter law that it is unacceptable to leave a child that is younger than eight years of age in a car unsupervised in dangerous circumstances. Car law: No child under six years of age can be left in a car alone when the person responsible is more than ten feet away and out of sight of the car, unless a person ten years of age or older is also present in the car. Full law is below. It is unlawful for any driver or operator to leave a child or children under the age of six years unattended and unsupervised in a motor vehicle. (1) The term “unattended” as used in this Section means a child who has been left in a motor vehicle when the driver or operator of the vehicle is more than ten feet from the vehicle and unable to continuously observe the child. (2) The term “unsupervised” as used in this Section means an unattended child when a person ten years of age or older is not physically present in the motor vehicle. (1) A law enforcement officer who observes a child left unattended and unsupervised for a period in excess of ten minutes in violation of the provisions of this Section shall use whatever means are reasonably necessary to protect the child and remove the child from the motor vehicle. (2) If the child is removed from the immediate area by a law enforcement officer pursuant to the provisions of this Section, the law enforcement officer shall place notification on the motor vehicle. The law enforcement officer shall hold the child until the parent or guardian returns. Whoever violates this Section shall be fined not more than five hundred dollars, or imprisoned for not more than six months, or both. For each second or subsequent offense, the defendant shall be subject to imprisonment, with or without hard labor, of not less than one year nor more than two years and a fine of not less than one thousand dollars nor more than two thousand dollars, or both. Any law enforcement officer acting in good faith pursuant to the provisions of this Section shall have immunity from any civil liability that otherwise might be incurred or imposed. Car law: No child seven years of age or younger may be left in a car while the person responsible is out of sight of the vehicle, unless a “reliable person at least 13 years old” is also in the car. The full law is below. Car law: A child under the age of six years old may not be left alone in a car without the supervision of a person 13 years of age or older who is not legally incapacitated. The full law is below. 750.135a Leaving child unattended in vehicle; prohibition; violation; definitions. Sec. 135a. (2) A person who violates this section is guilty of a crime as follows: (a) Except as otherwise provided in subdivisions (b) to (d), the person is guilty of a misdemeanor punishable by imprisonment for not more than 93 days or a fine of not more than $500.00, or both. (b) If the violation results in physical harm other than serious physical harm to the child, the person is guilty of a misdemeanor punishable by imprisonment for not more than 1 year or a fine of not more than $1,000.00, or both. (c) If the violation results in serious physical harm to the child, the person is guilty of a felony punishable by imprisonment for not more than 10 years or a fine of not more than $5,000.00, or both. (d) If the violation results in the death of the child, the person is guilty of a felony punishable by imprisonment for not more than 15 years or a fine of not more than $10,000.00, or both. (3) As used in this section: (a) “Child” means an individual less than 6 years of age. (b) “Physical harm” and “serious physical harm” mean those terms as defined in section 136b. (c) “Unattended” means alone or without the supervision of an individual 13 years of age or older who is not legally incapacitated. (d) “Vehicle” means that term as defined in section 79 of the Michigan vehicle code, 1949 PA 300, MCL 257.79. Car law: There is no specific law. The only relevant law concerns when a child ten years of age or younger is left unattended in a car and causes a collision, injury, or death, while not under the supervision of a person fourteen years of age or older. The full law can be found here. Car Law: No child who is six years of age or younger may be left unattended in a car. The full law is below. (1) Sections 28‐710 to 28‐727 shall be known and may be cited as the Child Protection Act. (e) Subject of the report of child abuse or neglect means the person or persons identified in the report as responsible for the child abuse or neglect. Car law: No child who seven years of age or younger can be left in a car when “the conditions present a significant risk to the health and safety of the child,” or when the keys are in the ignition and/or the car is running, unless the child is being supervised by a person at least twelve years of age. The full law is below. NRS 202.575 Leaving child unattended in motor vehicle; penalty; exception. A parent, legal guardian or other person responsible for a child who is 7 years of age or younger shall not knowingly and intentionally leave that child in a motor vehicle if: (a) The conditions present a significant risk to the health and safety of the child; or (b) The engine of the motor vehicle is running or the keys to the vehicle are in the ignition, unless the child is being supervised by and within the sight of a person who is at least 12 years of age. A person who violates the provisions of subsection 1 is guilty of a misdemeanor. The court may suspend the proceedings against a person who is charged with violating subsection 1 and dismiss the proceedings against the person if the person presents proof to the court, within the time specified by the court, that the person has successfully completed an educational program satisfactory to the court. The educational program must include, without limitation, information concerning the dangers of leaving a child unattended or inadequately attended in a motor vehicle. 3. A law enforcement officer or other person rendering emergency services who reasonably believes that a violation of this section has occurred may, without incurring civil liability, use any reasonable means necessary to protect the child and to remove the child from the motor vehicle. No person may be prosecuted under this section if the conduct would give rise to prosecution under any other provision of law. The provisions of this section do not apply to a person who unintentionally locks a motor vehicle with a child in the vehicle. 6. As used in this section, “motor vehicle” means every vehicle which is self‐propelled but not operated upon rails. Car law: No child that is six years of age or younger may be left in a car when “the conditions … present a risk to the health of safety of the unattended child,” or when the keys are anywhere in the passenger compartment and/or the engine is running, unless the child is under the supervision of a person twelve years of age or older who is not mentally incompetent. The full law is below. As used in the Unattended Children in Motor Vehicle Safety Act: 1. “Person responsible for a child” means a custodial parent or legal guardian of a child, or a person who has been directed or authorized to supervise a child by that child’s custodial parent or legal guardian; 2. “Unattended” means beyond a person’s direct ability to care for or come to the aid of the child; and 3. “Motor vehicle” means the same as defined in Section 1‐134 of Title 47 of the Oklahoma Statutes. A person responsible for a child who is six (6) years of age or younger shall not leave that child unattended in a motor vehicle if: 1. The conditions, including, but not limited to, extreme weather, inadequate ventilation, or hazardous or malfunctioning components within the vehicle, present a risk to the health or safety of the unattended child; or 2. The engine of the motor vehicle is running or the keys to the motor vehicle are anywhere in the passenger compartment of the vehicle. It shall not be considered a violation of this section if the child is accompanied in the motor vehicle by a person at least twelve (12) years of age who is not mentally incompetent as defined by Section 1‐ 103 of Title 43A of the Oklahoma Statutes. Any person convicted of violating the provisions of this section shall be punished by a fine of not less than Two Hundred Dollars ($200.00). Any person convicted of a second or subsequent violation of the provisions of this section shall be punished by a fine of not less than Five Hundred Dollars ($500.00). Any person convicted of violating the provisions of this section who has left a child unattended on the premises of any establishment which holds any license for the sale of alcoholic beverages for consumption on the premises pursuant to Section 521 of Title 37 of the Oklahoma Statutes, and who has consumed any alcoholic beverage during the period of time the child has been unattended, shall be punished by a fine of not less than One Thousand Dollars ($1,000.00). Nothing in this section precludes prosecution under any other provision of law. Car law: No child under six years of age may be left in a car alone when the person responsible is out of sight a the car and “under circumstances which endanger the health, safety or welfare of the child.” The full law is below. 3701.1. Leaving an unattended child in a motor vehicle. (a) General rule.‐‐A person driving or in charge of a motor vehicle may not permit a child under six years of age to remain unattended in the vehicle when the motor vehicle is out of the person’s sight and under circumstances which endanger the health, safety or welfare of the child. (a.1) Applicability.‐‐This section shall apply to the highways and trafficways of this Commonwealth and, for the purposes of this section only, the term “trafficways” shall include, but not be limited to, parking lots. (b) Penalty.‐‐A person who violates this section commits a summary offense. It is a separate offense for each child left unattended. Law for leaving child in car: unknown. Car law: No child six years of age or younger can be left in a car alone when the keys are anywhere in the passenger compartment and/or the engine is running, unless the child is under the supervision of a person who is thirteen years of age or older. The full law is below. 55‐10‐803. Offense of leaving child unattended in motor vehicle — Penalty. (a) It is an offense for a person responsible for a child younger than seven (7) years of age to knowingly leave that child in a motor vehicle located on public property or while on the premises of any shopping center, trailer park, or any apartment house complex, or any other premises that is generally frequented by the public at large without being supervised in the motor vehicle by a person who is at least thirteen (13) years of age, if: (1) The conditions present a risk to the child’s health or safety; (2) The engine of the motor vehicle is running; or (3) The keys to the motor vehicle are located anywhere inside the passenger compartment of the vehicle. Car law: No child who is six years of age or younger may be left in a car alone for longer than five minutes unless the child is being supervised a person who is fourteen years of age or older. The full law is below. (a) A person commits an offense if he intentionally or knowingly leaves a child in a motor vehicle for longer than five minutes, knowing that the child is: (1) younger than seven years of age; and (2) not attended by and individual in the vehicle who is 14 years of age or older. ** If the child is injured the charge is then child endangerment which is a felony. The penalties are six months to two years in jail and a fine up to $10,000. Car law: No child who is eight years old or younger may be left in a car alone unless the child is under the supervision of a person that is nine years of age or older. The full law is below. 76‐10‐2202. Leaving a child unattended in a motor vehicle. (1) As used in this section: (a) “Child” means a person who is younger than nine years old. (b) “Enclosed compartment” means any enclosed area of a motor vehicle, including the passenger compartment, regardless of whether a door, window, or hatch is left open. (c) “Motor vehicle” means an automobile, truck, truck tractor, bus, or any other self‐propelled vehicle. (2) A person who is responsible for a child is guilty of a class C misdemeanor if: (a) the person intentionally, recklessly, knowingly, or with criminal negligence leaves the child in an enclosed compartment of a motor vehicle; (b) the motor vehicle is on: (i) public property; or (ii) private property that is open to the general public; (c) the child is not supervised by a person who is at least nine years old; and (d) the conditions present a risk to the child of: (i) hyperthermia; (ii) hypothermia; or (iii) dehydration. (3) This section does not apply if the person’s conduct that constitutes a violation of this section is subject to a greater penalty under another provision of state law. (4) This section preempts enforcement of a local law or ordinance that makes it an infraction or a criminal offense to engage in the conduct that constitutes a misdemeanor under this section. (5) Notwithstanding any provision of state law to the contrary, a conviction under this section may not be used by a state or local government entity as grounds for revoking, refusing to grant, or refusing to renew, a license or permit, including a license or permit relating to the provision of day care or child care. Home alone age: 11 (guideline). Car law: No child under the age of sixteen can be left left in running car alone. The full law is below. RCW 46.61.685 Leaving children unattended in standing vehicle with motor running — Penalty. (1) It is unlawful for any person, while operating or in charge of a vehicle, to park or willfully allow such vehicle to stand upon a public highway or in a public place with its motor running, leaving a minor child or children under the age of sixteen years unattended in the vehicle. And here is another list of Latchkey Laws. Ignore the fear-hyping verbiage and just consult the table. Please include the District of Columbia in this list. I have heard of parents who deliberately leave the keys in the ignition on the theory that it will be obvious that the driver is coming right back. But legally, you are better off taking the keys. And now in Georgia people are protected by law and encouraged to bust windows. Cannot see anything going wrong with that. I will say that I lived in Ohio and at the the time CPS came to my home claiming my then 14 and 7 year old daughters had been outside playing together unsupervised in our own yard and started an investigation. We were cleared but also warned that they could not be outside on our farm with out adult supervision period. Thank you for this!!! Nice to have some ammo. The greater problem is that CPS doesn’t need “a law” to restrict or enforce “rules.” .They literally are empowered to just make them up as they see fit. These kafka-esque like agencies function autonomously, outside the normal judicial system, avoiding any due process rights of the parents. There is no hearing, no appeal. Do as they order you…or else they will take your kids on the spot. Yeah, about that substantial risk of harm? I wonder how that will be interpreted. WA car code needs some clarification. There is a time when children cannot be left alone in parked car. That is when the car is in front of a bar that serves alcohol. I think the assumption is that the parents would be inside the bar, but I am not sure that on a business street with little parking that it would not apply then as well. I can tell you from first hand experience that in Virginia if you fail to follow the guidelines you can be charged with contributing to the delinquency of a minor. I am also interested in the District of Columbia. My googling has not found a specific law but of course I could be missing it. And then it goes on to list 15 factors that should be considered to determine how reasonable/unreasonable it is, including length of time, etc. I hate to see websites just list 14 because then people who are less free-range see that and internalize it. Just a correction…It is my understanding that IOWA has a zero tolerance car rule. No child can be left in the car for ANY length of time. I know people who have been mowed down by this law. (goes on record, end of licensure…etc.). And, of course, the main problem is the absolute nature of most of these laws and the gross discrepancies between states. One state…you are fine…another you can get 10 years in prison. Could someone please give me a bit of assistance? I’m totally blind and PDF is not blind user friendly. Does anyone have any idea where I can find a text, word document or html copy of the rules for Vermont? Thanks in advance. There’s a little more on there – that the older the child, the safer, that a couple of hours is different from overnight, etc. Common sense stuff. I feel like this is a terrific paragraph and exactly what authorities should do – look into cases individually instead of having blanket rules. My experience is that kids are out alone here in DC often. Also that the police aren’t interesting in hassling parents for it. The one time the police were called in a public place about my kids, they made it clear they thought it was fine for two 10 yos to be unattended. So…let’s say that someone proves they’re economically disadvantaged and that’s why they left the underage kid in the car…..how the feck would parenting classes help? The problem was that they didn’t really have a choice, not ignorance. Wouldn’t a slightly better solution to be to help them find benefits/childcare while they attend the interview? I am bothered by the number of laws that are worded vaguely, along the lines of “if there is significant risk” or “for extended periods of time.” This is open to interpretations ranging from the chance of getting a paper cut being “too dangerous” to leaving a child alone for a full word day being “not very long.” If a state feels that it must pass a law, make it clear! Don’t pass a law that leaves parents just as confused and vulnerable as they were before. It also makes me aware of how difficult we make it in the US to travel or move from state to state and have any idea what the laws are. A family who dutifully follows the law in CA, for example, and routinely leaves their 12 year old in charge of their 6 year old in the car when they run in to the pharmacy, could be arrested if they did the very same thing while on vacation in Illinois. Do their children become less capable once they drive across the Illinois border? Laws with “vague” wording are still preferable to codifying every possible condition and situation and/or requiring a life sentence for stealing a slice of pizza because of strictly worded laws. Similarly, although laws which differ from state to state may be confusing, I’d rather have at least the illusion of local control. Imagine the federal government trying to cobble all of these state laws into some overreaching law of the land that only 5% of the public likes. I’m surprised there’s no law against “transporting a minor across state lines for the purpose of leaving him unattended in a non-running vehicle for longer than 15 minutes”. I’ll go out on a limb and say that most of these sound fairly reasonable. That assumes that reasonable people are interpreting them, which is not always the case, unfortunately. Whoo-hoo! My state is awesome! so, Wisconsin is pretty free range eh? That’s awesome! The “definition” of child neglect needs fine tuning. I refer readers to the link above to the child welfare web site. In the definition two terms are wonderfully vague so as to admit any interpretation. Those terms are: “Any recent act…” & “imminent risk”. How recent is recent? Two hours? Five days? 2-8 weeks, 183 days? Last 10 years? What level of probability constitutes a risk? Every daily action is fraught with a risk of being hit by an asteroid, an imminent one. The level of risk that is considered to trigger child neglect must be quantified. 20% would be a good place to start. Qualitative statements in laws are fine, but in laws, whenever possible, any statement that can be quantified must be quantified. So it’s better to take a child INTO the liquor store while I grab a six-pack? I can’t figure out what they’re afraid of if into an establishment that sells alcohol is better than outside of. The outline of the law for Illinois referenced above is inaccurate and overly simplified. I read online that in February a law was passed in New York making it illegal to leave a child under the age of 8 in a car alone. And if you had more than one child in the car, one of the children must be over the age of 12. I parked along the sidewalk of a strip mall to drop off a package at a UPS Store. I was never more than 20 ft from the car which had my 4,5 and 7 year old in it. The vehicle was not running and the store and had huge windows they were completely in my line of site. I was in the store for 10 seconds and I noticed a woman looking at my car and talking to someone about it. I step outside the store ask if there was a problem, she began to berate me. I went back inside dropped off my package then returned to my car. She continued to berate me and threatened to call the police. I said “Please do, I’ve done nothing wrong”. She did some more cussing. I gave her a firm middle finger and went on my way. I do not think what I did was morally wrong, was it a legal offence? I live in Washington state. Anne don’t feel bad one instant. Many years ago something similar happened to me on an early Sunday morning running in for a quick cup of coffee, parked directly outside, in complete sight of the car with sleeper in car seat. Total transaction time 30seconds or less. In my opinion the proper thing to do would have been for that person to be helpful and say… “Don’t worry I’ll cover them while you run in… I know how it is.” or just be silent and keep a protective eye on them without looking like a scary stalker. In both scenarios they have done their duty as a good person and not made you feel like crap – it’s a win for everyone. I understand that some people feel conviction to voice their concerns rather than stand by and be silent but they could take a non-confrontational tact and everyone would feel good about it. Now you feel bad, and she’s a jerk. How does that help anyone? Funny you say that Warren Pacholzuk; yet, you’d go and tell someone else that if they were caught busting your truck window that you’d basically kill them. You sir are delusional. This is not exactly accurate. We live in Virginia and homeschool. Our daughter will be 9 in a couple of weeks and our jerk of a neighbor called CPS and they are throwing a fit. She is with a sitter now but because I refused to give them the name of the sitter (cause they were already harassing us and our neighbors), they took me to court…and they are STILL harassing us. Their ‘guidelines’ to them ARE LAWS. They have nothing on us, but are making our lives a living hell. They even entered our house when she was at the sitter’s and I was at work, because we left our back door open for our elderly dog to use the bathroom. THEY TOOK HIM and then they played tag so that no one is accountable. We got the dog back but they are insisting that we take him to the vet, (they said they took him to an emergency vet and gave me the street…well that is one of the vets we use and he isn’t even open that day and said they need to call him if they are trying to say that he saw him that day). The dog is 16 and on what I call ‘hospice’ care. He is happy and not suffering, but they are using his frailty to bully us 🙁 My lawyer said that they won’t go by daughter’s abilities (she is big for her age and gifted) that STRICTLY, if she isn’t 12 she can NOT be left alone at home, even with neighbors close by that usually watch her :/ Be careful, or the police will be on your case whether you are doing what is right for your child or not. As someone stated in the comments, CPS does NOT follow laws, they make them up and the ‘rules/guidelines’ are VAGUE for their benefit, not ours. I have an English degree, and work as an interpreter, and they are still trying to get around their own ‘guidelines’ and the judge is no better. He won’t even truly assess the child’s ability–neglect in Virginia is not having ‘adequate (vague) supervision based on the age and level of development (also vague). Primarily they are trying to say that a 10 yro may be ok (for however long THEY deem ok) but that a 15 yro may be immature and should not be left alone. Please don’t think that they are protecting anyone. I was charged with child neglect for leaving my children in the car for a few minutes in a well-lit parking lot in Arizona in autumn. Some well-meaning citizen called the cops. My lawyer has said he managed to get diversion for me, but I will actually have my court date in a few days. The prosecutor wanted to slap a misdemeanor on my record, which in AZ stays on for life, but if (when) I complete diversion, the case will be dismissed. Since I don’t know how the case will be classed (minor crime, assault, or domestic violence), my diversion could last 3, 6, or 9 months. I won’t know until I’ve gone to court. What’s scary about this is, if I couldn’t secure private counsel, I may have gotten thrown in jail for six months. I don’t understand how this is helpful to children. I’m a single mom and now I’m up to my neck in legal fees which are putting me through a hardship, but the alternative would’ve been being taken away from my children when I am their primary parent. How is this looking out for the children? On top of the criminal aspect, I also have the Department of Child Services investigating me. I have hired yet another lawyer to contend with that. Yes, there’s no law that says you can’t leave your children in the car in Arizona, but you can’t account for over-zealous cops and busybodies. This cop made up the craziest scenario to justify her decision to charge me with a crime. Be careful. We aren’t allowed to make decisions for our own children anymore. So how is it that no kid can be left alone in a car in washington state unless there 16 is this really a law? So if I run into pay for gas lock mu doors and tell my 6year old not to open the door for noone I can be charged? Even with me having the keys and being 40feet away paying for gas? Is it against the law in the state of Texas to leave a 9 year old child alone at night? I live in California,I allowed my 6, 9, 10, 11 year old kids and one 9 year old neighbor child to go to the park with a cell phone to call 911. the park is right up the street from my home and around 730 it was light outside they were to be headed home. This was a group of kids so I felt it was OK for this. Well 8 o’clock came and they had not appeared so I sent my teenager, the police had my kids and walked them home. They demanded to search my home and informed CPs likely will show up at my home. What are the laws if any to protect me? Is there a similar list for Canada? 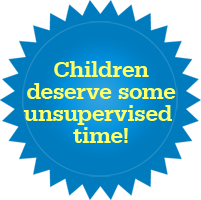 What about children playing outside with other neighborhood kids….UNSUPERVISED? In California….I have 3 kids that go and play with the other kids in the neighborhood, I go out and check to see what they’re doing from time to time. However, I have a neighbor that threatened to take pictures of the kids playing unsupervised and call the cops!….It’s not a suburban area…it’s a block with multiple apartments, so we don’t have back yards for the kids!….plus, the kids are not toddlers, they are 12, 9, and 7. Very curious because the last thing I want is to get in trouble…nor do I want the kids cupped up in the house all day!. Thanks. The free-range idea doesn’t work well if you’re in a dicey urban neighborhood. Does anyone know of rules for 13 year old to be left at mall with friends and no adult supervision in utah??? Provide the statute and show your research. Otherwise you are just another Internet wannabe. The Washington state law is more than accurate . . . Well now that I think of it all of the laws are up to date and ready for readers to read. The info for NY is incorrect. Any child under the legal driving age cannot be left in the car unattended by an adult. I was told this by a police officer, who was wanting to write me a ticket for leaving my child who was of babysitting age, in the car while I turned my back for one moment to deposit a Redbox movie into the box which was no more than 20 feet away. Apparently, it’s illegal to even stand outside of the vehicle to even have a conversation with someone, and to leave your children unattended inside the vehicle. This was as of at least 3 years ago, I think at that time it was 2012 or 2013. South Carolina’s section needs updating. Under nine may not be left with anyone under twelve, or longer than five minutes. I just thought I would point out that the law in Il. is actually quite vague. Unfortunately, there is no magic age at which children develop the maturity and good sense needed to stay alone. I have child age 7 and 8 . I’m work all night . Can I can let they sleep all night by them self ? I’m live Kansas City Missouri . Lily – It is never a good idea to leave your children at home all night! I am sure it is not legal, and even if it would be, it is not safe. Anything could happen. An adult needs to be available for those children all during the night for any need that would arise on their part, and any emergency situation that could arise. What about city ordinances involving free range children? Do they supercede state law? Hi, the information on Oregon should be updated. I was recently informed by a police official that I could not leave my four year old in the car unattended while I ran into the gas station to pay (less than 5 minutes)–they cited this child neglect law. The law is written so subjectively and vaguely that it sounds like parents can make a judgement call (ie, in my example, there was no way she was in harm for the five minutes it took me to run inside–and I could see the car the entire time! ), but they have no chance if it would go to court. Oregon does not have a law specifically stating the exact age when children can be left home alone. However, the child neglect statutes do offer some guidance. 163.545 Child neglect in the second degree. (1) A person having custody or control of a child under 10 years of age commits the crime of child neglect in the second degree if, with criminal negligence, the person leaves the child unattended in or at any place for such period of time as may be likely to endanger the health or welfare of such child.